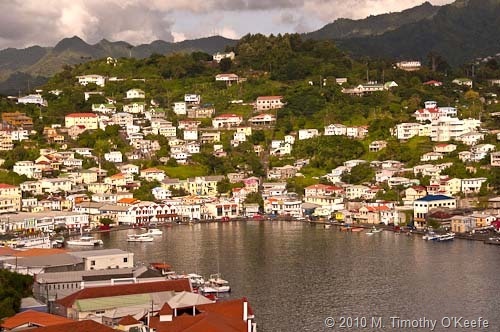 Grenada (pronounced “Greh-NAY-dah”) so reminded early Spanish sailors of the beloved green hillsides above their home port they named it Granada (“Grah-NAH-dah”). 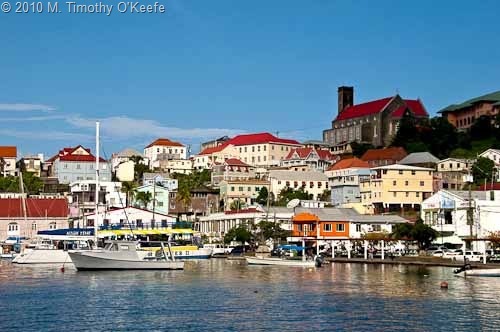 The spine of a steep hill divides St. George’s, the island capital. The harbor side of the hill, known as the Careenage, is the most picturesque. The cruise dock is located on the wrong side at the Esplanade, which has been developed extensively due to the fairly recent opening of the cruise port. The most obvious way to walk over the hill is by sidewalk. No thank you. The streets of St. George’s are so steep that during the annual carnival, steel band platforms have had to be winched up and down the main roads because motorized vehicles had difficulty hauling and breaking with such heavy loads on the dramatic inclines. The easiest access to the Careenage is to go through the hill, not over it. The Sendall Tunnel, was built in 1895 a shortcut to avoid contending with all the hilly ups and downs, is not a walking route most visitors would consider since the narrow one-lane road is used mainly by vehicles. 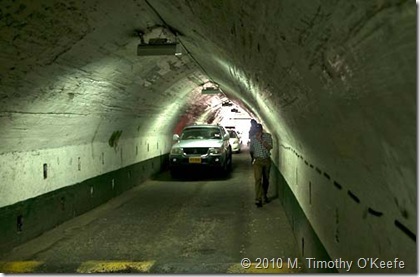 This being the Caribbean, islanders figure if cars and minibuses can use the tunnel, they can, too. And do. I urge Linda to follow me into the tunnel and walk on the right side, hugging the wall. 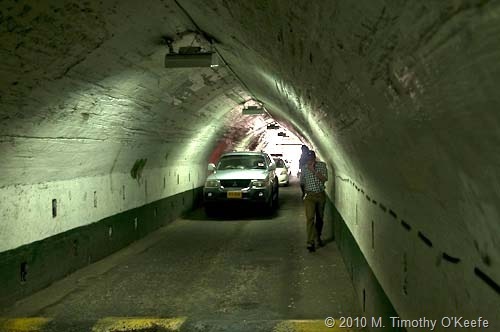 Vehicles go only one-way in the narrow confinement, and it happens to be towards us. Good! That way we know if we might be run over and press ourselves into the tunnel wall when it looks like we might get clobbered. Foot traffic in the tunnel goes both ways and we sometimes have to stop to wait for a minibus to pass but with most cars it’s possible to pass the person coming the other way. We should have no problems unless we encounter a tourist with a rental vehicle hogging too much of the road. I’ve always been wary of walking through this tunnel but the Maasdam is in port only until late afternoon and we have a lot to see. I do not tell Linda about my previous misgivings about using the tunnel on foot; she knows I have been here many times and figures I know what I’m doing. No reason to upset her. We exit into bright sunshine and only two flat blocks from the waterfront. The cobblestone street When our access street intersects with the Careenage, we stand next to the National Library, a brick warehouse is where it has been located since 1892. The library itself was established in 1846. 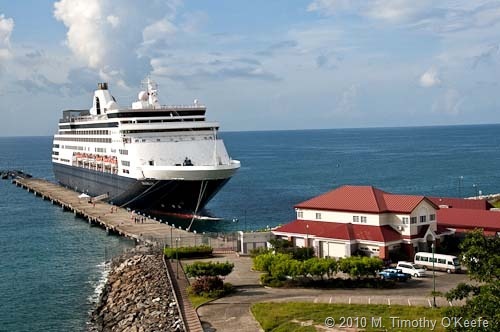 Many cruise ship visitors don’t come over from the Esplanade to the Careenage since St. George’s harbor remains a working, commercial hub with few attractions for tourists. For me, the harbor’s authenticity is part of its appeal, along with the old homes bordering it. This is my first visit to Grenada since Hurricane Ivan wrecked the city, leaving most of the structures without a roof. The color of the harbor has changed dramatically. Previously, there was a much greater variety of colors, delicate shades of yellow, beige and rose. Now almost all of the wooden buildings have been painted white, which makes them glaringly bright. Fortunately, most have reclaimed a red roof of some sort, which helps brighten up the scene. Expecting to find more reminders of the previous St. George’s appearance, such commonality of color is a disappointment. But I’m thankful how well the town has been restored following such devastation. One battered building right on the waterfront in the center of the Careenage has yet to see any reconstruction. The stone dwelling, basically an empty shell, starkly illustrates how badly St. George’s suffered. good indicator of how St. George’s suffered from Ivan. 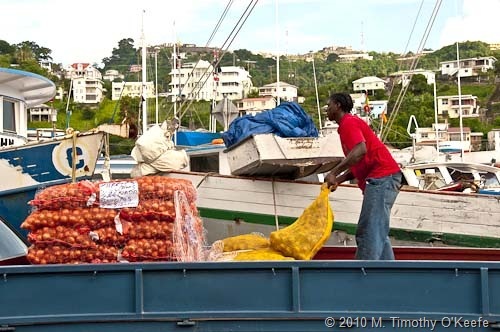 Several large wooden boats are taking on cargo to transport to neighboring islands. The diversity of supplies is intriguing. One boat is filling its open bow with 20-gallon propane tanks. I assume these are empty the way one man on a truck platform tosses them to the crewman on the boat. Several dozen cylinders have been loaded already and the men show no fatigue. 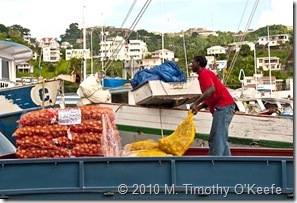 Another boat is loading sacks of potatoes and onions. These heavy loads have to be tossed up and caught as well. Not that I ever could do this, but appreciating this backbreaking task reminds me how out of shape I am from sitting in front for a computer for sometimes 12 hours a day. Either of these two men could probably win a championship arm wrestling contest. About half around the horse-shoe shaped Careenage is a statue of Christ looking toward the harbor and with his arms raised skyward. This is the Bianca C Statue, which commemorates the courage of the Grenadian people in saving passengers aboard the 600-foot Italian luxury liner which caught fire in St. George’s Harbor in 1961. Three crewmen were killed in the boiler explosion. The “Bianca C” now rests in 160 feet of water offshore, one of the largest Caribbean wrecks accessible to scuba divers. I’ve dived this wreck four times. 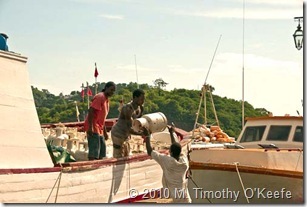 Three were in early morning to avoid the strong current that always picks up during the day, regardless of the tides. And once I visited the ship at night where I found a green turtle sleeping in a hold of the ship. A storm before Ivan broke the Bianca C in two; what might Ivan have done to it? In the afternoon I make the dreaded steep climb up to Fort George, which has the best panoramic overview of St. George’s for that time of day. Built by the French in 1705 to overlook the harbor mouth, Fort George is now the city’s main police station. The imposing fort supposedly still contains a system of underground tunnels once linked to other fortifications. 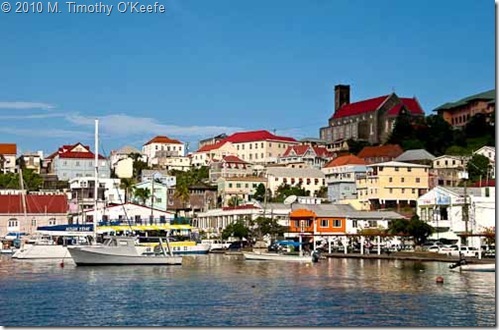 Fort George is the best vantage point to understand how Grenada and St. George’s harbor were formed. 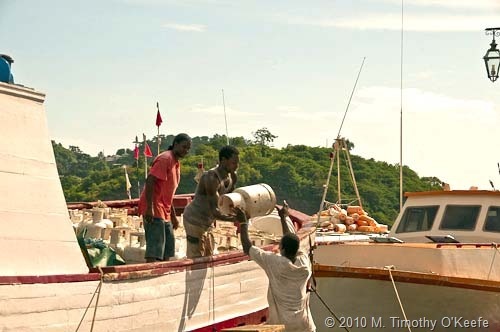 Like many Caribbean islands in this region, Grenada is of volcanic origin. 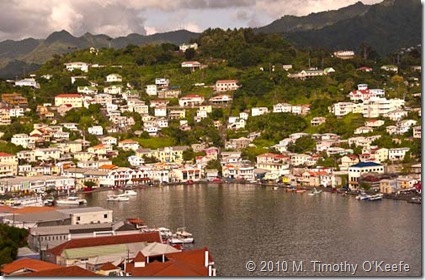 And the harbor of the capital city, St. George’s, is actually the crater of an extinct volcano. Scientists say that the crater was an inland lake before an opening was created to the sea. So, the Careenage has a long history of violent natural forces, with Hurricane Ivan perhaps the worst in human history. 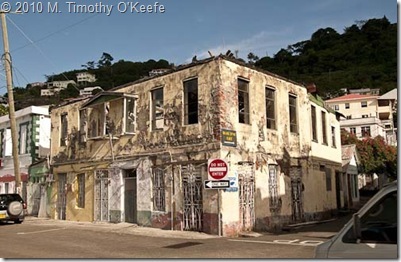 Considering the havoc the storm created, St. George’s is fortunate to have bounced back as well as it has. I decide to get over all that bright white paint blinding me from the surrounding buildings. Thank heaven they and their residents are still here.